Today, May 23, 2018, The Montreal Neurological Institute and Hospital (The Neuro) gratefully acknowledged significant government funding and unveiled the Thinking Ahead Campaign (2007-2013) donor wall as a tribute and thank you to the many people who helped transform The Neuro’s ability to deliver cutting-edge research and clinical care. This ambitious campaign brought people from around the world together to share in one common goal: to accelerate the pace of neuroscience discovery and deliver exceptional care to patients. The event was attended by Suzanne Fortier, Principal and Vice-Chancellor of McGill University, Jacques Bougie, Co-Chair of the Thinking Ahead Campaign and Chair of the Neuro Advisory Board, and Dr. Guy Rouleau, Director of The Neuro. They were joined by campaign donors and volunteers. Philanthropic and government funds have allowed The Neuro to construct the new North Wing, acquire novel technology, fund the work of exceptional scientists and clinicians, and establish innovative programs, while creating an inspiring research environment. Thanks to the impactful generosity of our community of donors, The Neuro’s $40-million Thinking Ahead capital campaign exceeded its goal, raising more than $49-million towards vital priorities. 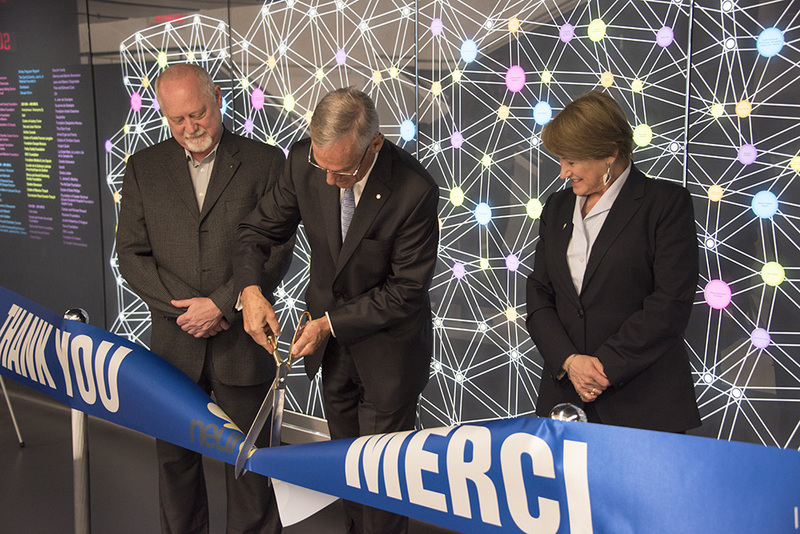 The Donor Wall art, which is inspired by the brain, uses light and colour to mirror complex neural networks in the brain and symbolizes the important link between science and philanthropy at The Neuro. Government of Quebec - Ministry of Economy, Science and Innovation- Programme de soutien à la recherché, volet 2 (PSRV2), of $17.9 million. This grant provided the funding necessary to achieve the final construction and outfitting of the North Wing as well as a new microscopy facility – equipped with the latest generation of super-resolution microscopes. The Neuro is grateful for the Government of Quebec’s constant support and confidence in their mission to understand the nervous system, and develop effective new treatments for neurological diseases and disorders. The Canada Foundation for Innovation (CFI) grants of $14.1 million to the Montreal Consortium for Brain Imaging Research and $2.5 million to the International laboratory for Brain, Music and Sound Research (BRAMS) provided critical funds for these programs. Neurological diseases represent one of the leading causes of disability and lost productivity in Canada. The technologies and projects listed below are housed in the new North Wing. They hold enormous potential to improve the quality of life of patients here and around the world. The McConnell Brain Imaging Centre has the most advanced neuroimaging technologies, including a magnetoencephalography machine (MEG) and a 7-Tesla MRI scanner (to be installed in 2019). These machines provide a new level of imaging accuracy that help researchers and clinicians understand the mechanisms behind neurological disease. Through early detection of disease and the development and evaluation of therapeutic strategies, neuroimaging can improve patient - and by extension - societal outcomes. MEG is a highly-advanced imaging technology that measures brain activity by recording magnetic fields produced by electrical currents occurring naturally in the brain. At The Neuro the MEG is being used to make advances in research to improve memory to biofeedback techniques to help epilepsy patients, amongst other applications. Dr. Robert Zatorre, Co-director of BRAMS, conducts research on the organization, function, and dysfunction of the nervous system in relation to basic and complex auditory processes. The new lab encompasses audiological testing, brain stimulation, high-density electroencephalography; a mock scanner for training and preparation of participants for scanning, and for training in the use of MRI-compatible musical instruments, a visual testing lab, a behavioral testing lab, and workstations for visiting scholars or students. The Manulife Atrium houses a Healing Garden, where patients, staff and visitors can enjoy the serenity of an airy greenspace and sunlight. The Healing Garden was carefully designed to be a calm and tranquil space for pause and reflection. Natural, artificial and night-time lighting are integrated to create a soothing visual effect.